ලෝක වෙළෙඳ මධ්‍යස්ථානය (කොළඹ) ගොඩනැගිලි ද්විත්වය. පහත දැක්වෙන්නේ ශ්‍රී ලංකාව තුල පවතින උස් වූ ගොඩනැගිලි සහ ඉදිකිරීම් වේ. තට්ටු 20 ට අඩු පවත්නා ගොඩනැගිලි සහ උස 75 m (246 ft)ට වඩා අඩු ගොඩනැගිලි මෙයට අන්තර්ගත නැත. ශ්‍රී ලංකාවේ බොහොමයක් උස් වූ ගොඩනැගිලි පිහිටා තිබෙන්නේ විශාලතම හා ප්‍රධාන වාණිජ නගරය වන කොළඹ නගරය තුලයි. 2 ඉදි කරමින් පවතින, අනුමැතිය ලද සහ ඉදි කිරීමට අදහස් කරන ගොඩනැගිලි. සෙලින්කෝ හවුස් කොළඹ මීටර 51 යි 16 1960-???? 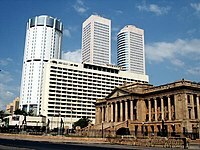 ↑ "World Trade Center – Colombo, Sri Lanka". Wtc.lk. සම්ප්‍රවේශය 2013-01-18. ↑ 3.0 3.1 3.2 "ශ්‍රී ලංකා බිස්නස් නිව්ස් | ඔන්ලයින් එඩිෂන් ඔෆ් ඩේලි නිව්ස් – ලේක්හවුස් නිව්ස්පේපර්ස්". Dailynews.lk. 2011-11-29. සම්ප්‍රවේශය 2012-10-30. ↑ "රෙසිඩන්ෂියල් එපාර්ට්මන්ට්". Keells.com. සම්ප්‍රවේශය 2012-10-30. ↑ "ෆෙයාවේ ස්කයිගාර්ඩන්ස් | ෆ්ලෝර් ප්ලෑන්ස්". Skygardens.lk. සම්ප්‍රවේශය 2012-10-30. ↑ "The Monarch Tower | Buildings". Colombo /: Emporis. සම්ප්‍රවේශය 2012-10-30. ↑ "Fairway Holdings". Fairway Holdings. සම්ප්‍රවේශය 2012-10-30. ↑ "දි අයිලන්ඩ්". Island.lk. සම්ප්‍රවේශය 2012-10-30. ↑ Fernando, Santhush (2010-11-10). "Sri Lankan version of Rs. 11bn Eiffel tower mooted". Asian Tribune. සම්ප්‍රවේශය 2012-10-30. ↑ "Colombo Lotus Tower – Minister Basil Rajapakse Lays Foundation Stone | events". Trc.gov.lk. 2012-01-20. සම්ප්‍රවේශය 2013-01-18. ↑ "The Island". Island.lk. සම්ප්‍රවේශය 2012-10-30. ↑ "Altair Project". Altair.lk. සම්ප්‍රවේශය 2012-10-30. ↑ "The Destiny". Thedestiny.lk. සම්ප්‍රවේශය 2013-01-18. ↑ "Island". Island.lk. සම්ප්‍රවේශය 2013-01-14. ↑ "Fairway SkyGardens | Floor Plans". Skygardens.lk. සම්ප්‍රවේශය 2012-10-30. ↑ Gamini Gunaratna, Sri Lanka News Paper by LankaPage.com (LLC)- Latest Hot News from Sri Lanka (2012-02-24). "Sri Lanka : Shangri-La Hotel breaks ground in Sri Lanka". Colombopage.com. සම්ප්‍රවේශය 2012-10-30. ↑ "(Pvt) Ltd. ::". Sanken Construction. සම්ප්‍රවේශය 2013-01-18. ↑ Gamini Gunaratna, Sri Lanka News Paper by LankaPage.com (LLC)- Latest Hot News from Sri Lanka (2012-12-17). "Sri Lanka : Construction of Mövenpick Hotel in Sri Lanka to begin next month". Colombopage.com. සම්ප්‍රවේශය 2013-01-18. ↑ "ŕś‡ŕśšŕˇŠŕˇƒŕˇ™ŕˇƒŕˇŠ ŕśšŕˇ”ŕś˝ŕˇ”ŕśąŕˇš ŕśŻŕˇ™ŕˇ€ŕśą ŕś…ŕśŻŕˇ’ŕśşŕśť ŕś‡ŕśťŕśšŕˇš". Sinhala.news.lk. 2014-02-05. සම්ප්‍රවේශය 2014-02-13. ↑ "Welcome to C&S Engineering Management Sdn Bhd Official Website!". Csem.com.my. සම්ප්‍රවේශය 2012-10-30. ↑ "India’s ITC now finalises deal, Sheraton moves to Kollupitiya". Sundaytimes.lk. සම්ප්‍රවේශය 2012-10-30. ↑ "Welcome To SUCHIRNEB". Suchirneb.lk. සම්ප්‍රවේශය 2012-10-30. ↑ "Ocean View Towers Apartments, Colombo Sri Lanka". Lankapropertyweb.com. සම්ප්‍රවේශය 2012-10-30. ↑ 33.0 33.1 33.2 "Ambitious $ 460 m 4-towers Krrish Square at Fort to start selling units from today | DailyFT - Be Empowered". Ft.lk. 2012-09-27. සම්ප්‍රවේශය 2012-10-30. ↑ "Australia’s Property Alliance Capital signs MoU for US$ 450mn project". Dailymirror.lk. 2013-11-15. සම්ප්‍රවේශය 2014-02-13. ↑ "Ultra modern business centre at Nugegoda". Dailynews.lk. 2013-01-03. සම්ප්‍රවේශය 2013-01-18. මේ පිටුව අන්තිමට සැකසුවේ 9 ඔක්තෝබර් 2016 දින දී, 12:44 වේලාවෙහිදීය.